- Hus is a film which attempts to reveal the private and hidden layers of our habitation. It is a live animation film shot on location which incorporates both pixilation (stop motion) and time-lapse photography. Every single shot opens up a hidden layer of the house and exposes it to the passing light. 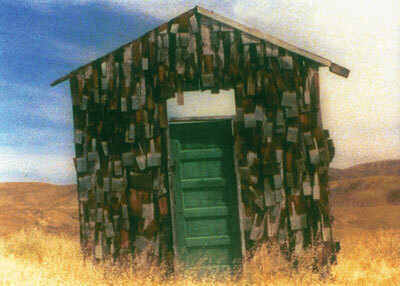 Within the accelerated time of the film the house gradually breaks down piece by piece and frame by frame. Once the house is completely dismantled it is reconstructed in a different location. It is a film about time and processes, about disintegration and construction. -In Hus I was interested in physically deconstructing and reconstructing one object. I imagined the house as a shell that separates “private and public spheres”. Through the use of animation I could open up this “shell” and examine it. Hus is shot with three cameras from different angles. In the editing I purposely didn’t cut the shots to motion, so that the film appears to be going back and forth in time.Hus was shot in the California desert, on the edge of Silicon Valley.